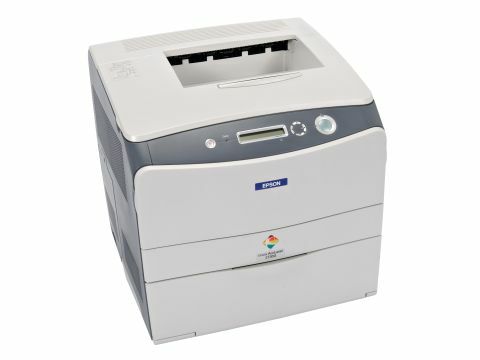 Compared to some of the more lightweight models around, you can tell that the Epson really means business as you struggle to lift all 28kg of printer out of its box. It's two to four inches larger in every direction than many other desktop colour lasers and even comes with a bigger stack of software, which we'll come back to later. Bucking the latest current trend for inline print cartridges, the Epson uses a full carousel for each of its four-tone cartridges. It also has a fixed imaging drum. This should last for about 42,000 pages, but when it needs replacing it'll cost you about £141. That's as much as the complete asking price of some similar printers. In addition, bear in mind that, as with other fixed imaging drum printers, the drum won't last nearly as long if you carry out a lot of colour printing. Indeed, if you only print colour then it'll probably only last for about 10,000 prints, making a significant impact on overall running costs. In much the same way that the Canon uses smoothing technology to boost its hardware print resolution, the Epson employs its own RIT (Resolution Improvement Technology) to boost the basic 600dpi to an enhanced 2400dpi. Even so, print speeds are impressive, with single mono pages taking about nine seconds to output and rising to 25ppm for multi-page printing. Particularly impressive for a carousel printer, the Epson also saw off most of the competition for colour print speeds, with about 18 seconds for single-page DTP or photo prints. This was all achieved with the basic yet generous 32MB of memory, which you can upgrade to a maximum of 256MB. Along with the outright printing speed of the Epson, you also receive some extra time-savers in the software collection. For example, there's Office Ready Essentials that gives you some 150 colour templates for presentations, flyers and business forms - all compatible with Microsoft Office. Also thrown in is a PDF creation tool and Web2Page software that's designed to automatically adapt web pages to the paper size that you're using. At the price, there are little in the way of extras. However, there are some handy onboard controls and an LCD display menu, which is good if you want to change basic printer settings or alter the default contrast of prints. A C1100N version is also available that comes with a built-in Ethernet interface, but this is also available as an optional extra for the base model if you decide you want to upgrade later. Other optional goodies include a 500-sheet second paper input tray and a duplex unit, as well as a wireless network adaptor. Print quality proved especially good for colour output in our tests, with lifelike yet uncommonly vivid colours being produced on standard plain paper. Fine detail was also particularly well reproduced. All in all though, the Epson is bigger and noisier in operation than much of its competition, as well as being a lot more expensive to purchase and run. Unless you really need the extra speed, you can buy better.